“That someone's smiling, right at me. 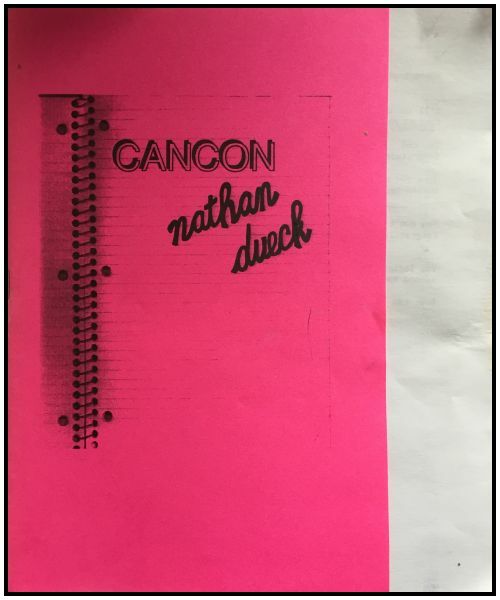 CANCON is an art nouveau poetry sendup inspired by the hit Canadian television show Degrassi Junior High by Nathan Dueck and above/ground press. Nathan Dueck is a Canadian Generation X Poet, born in Winnipeg. He has studied at the University of Manitoba and has written the books king’s (mère) (Turnstone Press, 2004) and he’ll (Pedlar Press, 2014). This is his second Chapbook published with above/ground press, the first being @BillMurray in Purgatorio (2013). This poetry is an esoteric, art nouveau send-up of the television program Degrassi Junior High. At once humorous and enigmatic, a disaffected view, a disconnect that is funny and tragic at the same time. It is broken, perhaps stilted dialogue as if a mix of spoken word with broken thoughts. An underscore of conversations between the young adults at school – perhaps a hidden dialectic or a hidden monster in sendup. convince my mom – she acts like she’s mega-poor. The names of the characters in the show, Snake, Wheels, Ms. Pelton, Dwayne, Mr. Raditch, Damon are woven into their disembodied dialogue, comments about parents, going to concerts, who won the science fair prize, running for class president. All in some kind of disconnected haze, perhaps a disconnected reality, maybe mimicking an acid trip. There is an interplay highlighting rights with permissions, a flow of variations on “I can” and “I can’t”, “you can” and “you can’t”, “they can” and “they can’t” that runs through the entire poem, as if some kind of adolescent nightmare descending on the unsuspecting. A humorous take on teenagers, and the audience sitting in front of the television being sucked up by television fumes. An exciting New Age poetry work, CANCON by Nathan Duek and above/ground press.